There's a lot to like about the improved second generation Kia cee'd, but those looking for more of the good stuff will be attracted to the Sportswagon estate model. Offering 528-litres of luggage room with the rear seats upright and 1,642-litres with the rear seats folded, it's got space aplenty. The history of the Kia cee'd doesn't take long to recant. It arrived in 2007, then instantly gained a reputation for offering excellent value for money in the family hatch class while delivering better quality than its price point suggested. A second generation car was fast-tracked into production and arrived in early 2012, a model better in every regard and right on the pace of the mainstream cars in the class, especially in the more efficient improved guise we're looking at here. Unfortunately in making it this good, the prices crept up a bit too, removing what for many was the key motivation for choosing the cee'd. So has it almost merged with the mainstream now? In some ways, yes. It's still priced at a little less than you'd pay for a Vauxhall Astra or a Ford Focus but the difference isn't huge. And, just as with those cars, there's the option of an estate variant if you need more versatility than the standard five-door hatch can provide. With the first generation cee'd, this version was called the 'SW'. These days, this variant is known as the 'Sportswagon'. As before, it's a useful inclusion in the range. The cee'd Sportswagon is a vehicle that builds on the hatchback's reputation for exceeding customer expectations. It's a Kia, so you might reasonably expect a few corners to be cut under the surface to make it that little bit more affordable, but check out the sophisticated multi link rear suspension and then look at the more rudimentary torsion beam rear end of, say, a Vauxhall Astra and consider who might have been making savings. Under the bonnet, the key news here is the introduction of Kia's latest 1.0-litre T-GDI turbo petrol direct injection engine, offered in 98bhp and 118bhp outputs. We can't really see much point in opting for the pokier version as its pulling power - 171Nm of torque - is no better than that of the base unit. Either way, if you want a petrol engine in your cee'd Sportswagon, this powerplant offers a far more satisfying choice than the old 98bhp 1.4-litre petrol unit that's still offered on lower-order variants of this second generation model. Most cee'd Sportswagon buyers though, want a diesel. There's an old-tech 89bhp 1.4-litre CRDi variant still available, but most buyers will want the more efficient, higher-tech 1.6-litre CRDi unit, offered with 134bhp. This powerplant gives buyers the option of a 7-speed dual-clutch DCT automatic transmission, one of those clever gearboxes able to seamlessly select the next gear before you've even left the last one. For this diesel variant, improvements in refinement have been prioritised, so additional sound-absorbing materials have been adopted for the carpet and ventilation system, while twice as much anti-vibration foam has been added to the dashboard panel to cut engine vibrations intruding on the calm of the cabin. Otherwise, things are much as before. So the driving dynamics still won't satisfy those for who see handling response as everything, despite the addition of a torque vectoring system, which reduces understeer by partially applying the brake to the inner wheel under cornering. You still get a supple multi-link rear suspension system, something that's still not the norm in this segment. And there's neat FlexSteer steering that allows you to alter feedback at the helm. Plus these models are as rapid as most owners will need them to be, the 134bhp diesel 1.6 making sixty two mph from rest in 10.5s on the way to 122mph. The discipline of turning a family hatchback into a modest estate car doesn't seem, on the face of it, to be too taxing an assignment but look back at some of the designs we've been offered down the years and there have been some proper horror scenes, vehicles that look like normal hatches being mounted by an amorous propagator. Examples include the weirdly broken-backed Citroen BX estate and the unhappy looking Fiat Croma estate. There's none of that here. Indeed, the cee'd Sportswagon has turned out to be quite an elegant thing. It retains the hatchback's wedgy rising beltline, with the result that the side windows to the rear of the car are really quite tiny. It nevertheless offers impressive practicality, even if there is a tad less space on offer than was provided by the old cee'd SW. Lift the rear hatch and you'll find a 528-litre load space with the rear seats upright, an area you can extend to 1,642-litres with the rear seats folded. The wheelbase is the same as the five-door hatchback, but the increase in overall length compared to the old cee'd SW means more passenger space inside. Front seat occupants have 12mm more headroom and 21mm more legroom, while rear passengers gain 5mm of shoulder room. As for changes to this improved version, well at the front, it retains Kia's hallmark 'tiger-nose' grille, along with wraparound headlamps and integrated fog lamps. Updates include a more angular and wider bumper, with chrome trim around the fog lamps, and a smarter oval-shaped grille mesh echoing many of the shapes and design forms on the front of the car. A similar change has been made to the rear, with reshaped bumpers, sporty-looking reflectors and LED lamps all featuring. There's a premium of around £1,200 to pay in choosing his Sportswagon bodystyle over the ordinary five-door hatch. That means pricing that sits in the £17,500 to £23,500 bracket. It all means that the days of a family-sized Kia hatch costing a lot less than mainstream rivals are well and truly gone. This cee'd Sportswagon doesn't really cost much less than competitors like, say, a Focus Estate or an Astra Sports Tourer. To try and maintain value as a unique selling point, this has forced the Korean maker to include more standard equipment than rivals and forgo the potential revenue that might otherwise come via the sale of optional extras. That's why the cee'd Sportswagon includes a bunch of gear that you'd normally be ticking boxes for in many of its rivals. There's a bright TFT high-definition instrument binnacle, dual-zone climate control, powered driver's seat adjustment with memory and a full length (1,045 mm long) powered panoramic glass sunroof. Depending on which trim you opt for, there's LED daytime running lights, fixed cornering lamps, and HID headlamps that turn the low beam to match curves in the road and enhance the driver's night vision. There's also the Parallel Park Assist System (PPAS) where the car uses its sensors to steer itself into a parking space. All you need to do is control the accelerator and brake. No car in this sector can afford to go to market with second-rate economy and emissions figures. Gone are the days when a low sticker price would more than mask the fact that the engines were a decade out of date. Indeed, if there's one thing that carbon dioxide-based taxation has done, it's driven manufacturers into a race to develop ever smarter and more efficient engines. 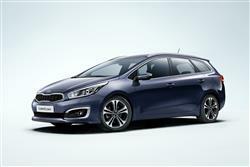 Kia is no exception and the latest clutch of cee'd powerplants deliver respectable numbers. As with the brand's other models in Europe, the cee'd Sportswagon is available with fuel-saving technologies developed under the company's EcoDynamics label. These measures, which are offered on both diesel and petrol models with manual transmission, include ISG (Start/Stop), low-rolling resistance tyres and an alternator management system (AMS). As a result, the entry-level 1.4 CRDi returns 67.3mpg on the combined cycle and puts out 109g/km of CO2. The more modern 134bhp 1.6-litre CRDi engine in the pokier diesel variant manages 72.4mpg and 102g/km of CO2. Kia's cee'd Sportswagon is one of those sensible choices that you might just enjoy making. If you had your eye on the five-door hatch version but felt your growing family perhaps needed a little more room, it'll be just about perfect. And even if you'd had no interest in Kia but came across one of these, you might just be tempted. For a start, most small estate cars are either deathly dull to look at, not especially spacious inside or inefficient to run. Or all three. This Kia is different. The styling's smart, the practicality's sufficient and the running costs are where they need to be. It feels of high quality inside too and is better equipped than comparable rivals. In summary, this model is yet further proof that not only has Kia closed the gap on many of its European rivals but has edged past many of them. If you're looking for a small estate car, it'd be wholly remiss to deny the Sportswagon a place on your short list.